Higher Kinnerton is in Flintshire, and was historically within the parish of Hope; but for ecclesiastical purposes, it has for many years been a chapelry of the parish of Dodleston, Cheshire, England. All Saints' Church was built in 1893. 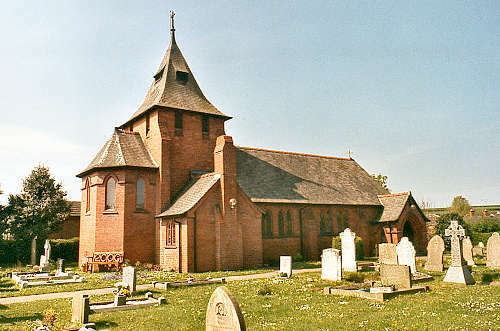 After the disestablishment of the Church in Wales, in 1920, the parishioners of Higher Kinnerton elected to stay within the parish of Dodleston. For normal purposes of local government and administration, Higher Kinnerton is a Flintshire village. However, the neighbouring village of Lower Kinnerton, which is about 1 mile to the north-east, is in Cheshire, England. For family history information about the church and parish, visit the GenUKI Higher Kinnerton page.